Designed by the PGA’s own Steve Elkington, Woodforest features 27 holes on a spacious course carved through the majestic pines and towering oaks of Northwest Houston. Since 2001 this classic design has appealed to golfers of all skill levels, deeming it a “player’s course.” Facilities include a pro shop, the Woodforest Grille, driving range, separate putting and chipping greens, and fairway and greenside practice bunkers. Daily private and group instruction is also available from their onsite PGA staff. Woodforest Golf Club is open for daily fee play seven days a week. 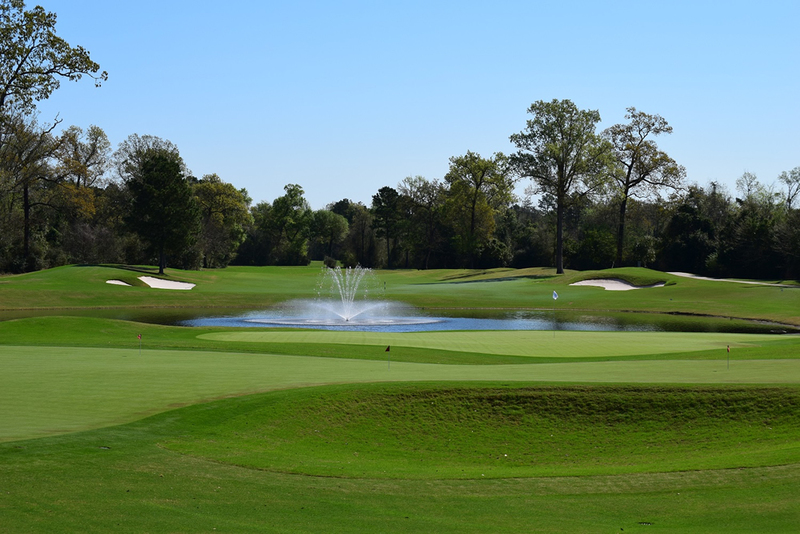 Located in Montgomery, Woodforest Golf Club plays over 50,000 rounds of golf each year and the greens have received statewide and regional recognition as the best in Houston. Woodforest’s top priority is to provide players with the best daily playing conditions, placing emphasis on the player’s needs and the feel of the game over aesthetics. The course offers exceptional putting surfaces with the most consistent speeds possible; green speeds average between 11 and 12 on the stimpmeter 95% of the time. The well-maintained facilities attracts players from the greater Houston area and beyond, making it a prime setting for many prestigious events. Woodforest has hosted a variety of Texas Golf Association tournaments and qualifiers such as: State Amateur Qualifier, Mid-Am Qualifier, State Senior 4-Ball Championship, and TGA Legends Junior Tour tournaments. Additionally, Woodforest is entering its 4th year as the host of the 72-hole PGA Champions Tour Qualifying School. TGA South Texas Regional Coordinator John Cochran has worked closely with Woodforest Golf Club on various tournaments.